John Bizas was born in Chios,Greece. From early age he was interested in fine arts and soon got involved in doing sculpture and design. The material he prefers to use is mainly marble, which he works in a particular way. His passion for marble is what made him move to Italy in 2008 - where he still lives and works. He first stayed in Florence for seminars in art and then at Carrara where he got graduated in fine arts by the local academy - part of the Pisa University. His characteristic style in sculptures is to use the empty space as material. With this he plays with the light of the ambient surrounding the sculpture and the glance of the viewer and letting both penetrate the form of the sculpture. As a result he creates marble sculptures very thin, light and delicate. His works are inspired by the problems of our world - like environmental disasters, wars, decay of the society etc.He has participated in several solo and group exhibitions. Title of the 1st project: "Άρπα"│ "Harp"
Concept: The sculpture represents the harmonic combination that exists in the city of Ayia Napa. The harmony between the rocks and the sea, between the classic and the modern, between the people of the different nationalities and cultures. Title of the 2nd project: "Γυναικείο Σώμα"│ "Kalos"
Concept: The myth wants the ancient Greek goddess Aphrodite (goddess of beauty) to been born in Cyprus. 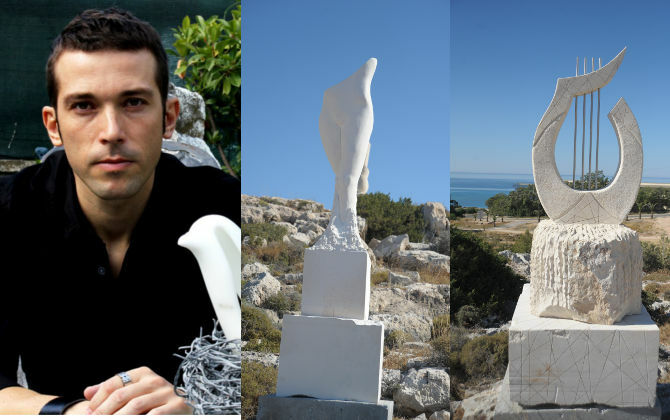 Inspired by the myth I create my sculpture "Kalos" (beauty in the Greek language) which represents the beauty of the landscape to take the form of an elegant female body and coming out of the rock.